Unlike embossing, "rigidizing" is a mated rolling process which we use to increase the realized wall thickness and strength of our aluminum cases by over 50% without increasing the realized weight. 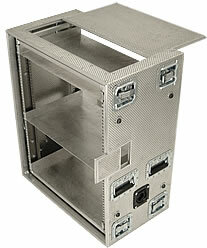 Over 35% lighter than plywood laminated rackmount cases, and more resistant to scratching and denting than deep drawn aluminum cases, our rigidized aluminum rackmount cases are formed using CNC equipment and fully TIG welded providing an extremely strong, water tight seam. Our series of custom designed mated aluminum valances are extruded from 6063 aluminum alloy for additional reinforcement, and all include a 7 pcf neoprene seal to prevent the ingress of dust and moisture. For inquiries regarding our GSA Schedule, or to discuss a rackmount shipping case design for your specific case requirements, please call our main facility (Toll Free) at 1-800-268-6000 between 09:00h and 17:00h EST, email our technical design team, or simply complete one of the appropriate Quick Quote case forms found throughout this web site. Have a custom rackmount case quote delivered directly to your email inbox. Learn about the hardware components that go into each rackmount case. Copyright © 2007 Quantum Scientific Inc. All rights reserved.